We have seen too many articles about the top N cookware sets on the internet. Rather than giving you a list of the 10 best Cookware Sets, top rated cookware set or best cookware reviews, we are going to give you an in-depth guide of cookware materials, cookware brands etc. The difference of cookware materials with advantages and disadvantages. Best Cookware for different cookware materials, e.g. Stainless Steel, Cast Iron, Aluminum cookware vs hard anodized etc. Choose the suited cookware according to lifestyle. We have confidence that when you have this knowledge, you will be able to choose the best cookware which suits your needs. Let’s discuss them in depth. What is the best cookware material? If you’ve ever been struck with indecision while shopping for cookware, not knowing whether to go with the anodized or the stainless steel pots and pans? Choosing the right kind of cookware material for your food is very important. Similarly, on the other hand, it is quite challenging to choose among different varieties. Nowadays, the market has so many cookware materials that one can choose for cooking purpose. Choosing the right kind of cookware material is crucial. However, the best cookware material is the one that matches your cooking style. So whether its aluminum vs non-stick or stainless steel, your convenience and cooking styling is important. If you are not satisfied with the material of cookware, the food will not be delicious. So it’s always better to choose the best cookware material by completely analyzing different products in the market. There comes different kinds of stainless steel and aluminum pots and pans, however, choosing the right one is time-consuming. All these materials have their own specifications, advantages, and disadvantages. However, the comparison between these cookware materials will help you to choose the best cookware material for your kitchen. Here you can find a comparison table of the different cookware materials. You have the pros, cons, the specifications as well as the link to Amazon for instant purchase. According to the table, you can find that copper is the best material, it heats up quickly and evenly. The con is that it is costly. Feel free to share this infographic. Needless to see Copper is the best conductor of heat, cooking quickly and uniformly, and reacting well to temperature changes. Copper cookware also has been hundreds of years of history. It can cool down rapidly after heating in order to control the temperature more precisely. This helps you maintain the temperature and taste of your food while cooking. For high-temperature rapid cooking, such as stir-frying, copper cookware is the ideal choice. 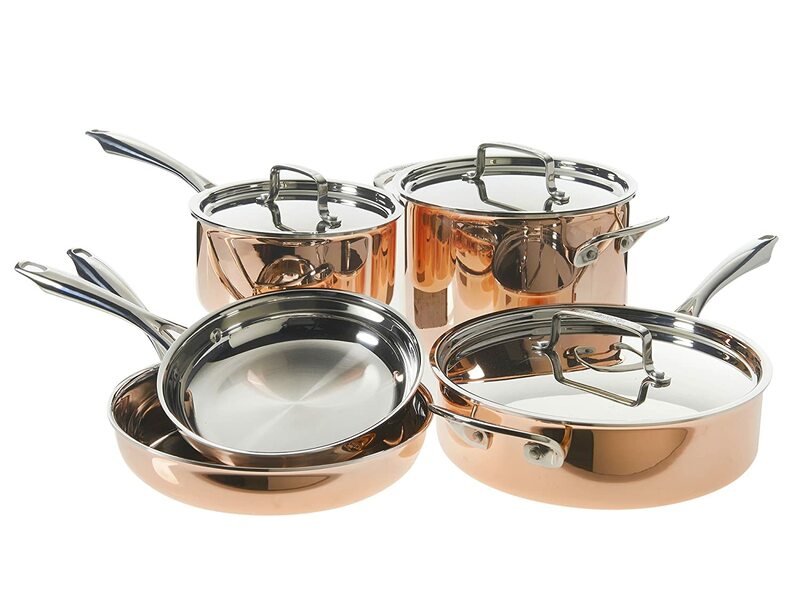 Since most Copper cookware is pricey, copper is the go-to cookware for professional chefs. Similarly, copper pans and tops are usually lined with stainless steel or tin so that the user doesn’t need to be fretful with copper toxicity. Amazing heat conduction can be conserved through the lining. The cookware made of copper has an excellent weight-means heavy enough to sit firmly on burners without being too weighty to lift easily with one hand. Copper Pots & Pans belongs to the "delicate" type of kitchenware, so it requires regular wiping and polishing to maintain color and luster. There are many copper-based cleaners on the market, e.g. Wright's Copper Cream, and you can choose to DIY at home - just mix flour, salt, lemon juice and ammonia to clean the pan. The copper exterior will let this set heats and cools quickly for precise temperature control, and it is 3-Ply Stainless Steel-Clad Construction, can oven Safe to 500° F. It's a so beautiful Copper Cookware Set, and easily outstanding in your kitchen. The copper surface will acquire a dark patina with use, it's not a defect, and you can follow the maintenance to clean the surface. Finally, it's a very good set of pans for the money and will serve you well for decades. Moreover, copper outer heats and cools for accurate heat control. The stainless stick grips stay cool and supply a comfy grip. We can say that Aluminum is a great conductor of heat, it is lightweight and heats food evenly. Since Aluminum reacts with acidic food which causes the metal to leach into the food, most of the aluminum cookware has either coated with a non-stick layer or it is anodized. When choosing Aluminum Pans, its quality is determined by the thickness. Generally, Small-caliber Aluminum Pans are usually thicker and more durable. After using the Aluminum Pans, it's better to cool it down before cleaning, in order to prevent deformation. It is better to use nylon or wooden tools to prevent scratches. Is hard anodized cookware safe? Anodized cookware is an electrolytic passivation process used to increase the thickness of the natural oxide layer on the surface of metal parts. (https://en.wikipedia.org/wiki/Anodizing) Anodized aluminum cookware should not corrode into food. Many people believe using aluminum cookware could cause cancer. They are also concerned about brain damage when using anodized aluminum cookware. Some studies found diseases caused by aluminum, but some experts said it is not related. So I don’t have a clear answer on that. Usually, in this case, I would avoid using it, or at least avoid using aluminum cookware to make acidic food, such as tomato sauce, because it will react with aluminum which eventually will get into your body. This is a fantastic set of Aluminum Cookware. It is light, good thermal conductivity, and interiors Coated in long-lasting nonstick for beautiful food release. Its handles are double riveted for strength and rubberized for grip and Comfort. It also oven safe to 350 degrees Fahrenheit, conveniently dishwasher safe and Lifetime Limited warranty. This is one of the best dish washable hard-anodized aluminum cookware which promotes extremely fast, even heating. The superior quality interiors coated with long-lasting non-stick which is amazingly convenient for beautiful food release. Safe for: Direct Fire, stovetop, grill, oven and broiler. Good for: Frying, searing, roasting, stove-to-oven recipes, and baking. Cast iron is one of the most versatile cooking materials and a great alternative to Non-stick cooking surfaces. Many professional chefs think the cast iron pan is indispensable kitchenware. Cast iron is extremely durable and can be preheated to temperatures that will brown meat, with good maintenance; it can be used for several decades. Cast-Iron pans are all-around players in the kitchen, suitable for frying, cooking, and baking. Cast iron pans need to be seasoned before use. For home use, it is better to buy the seasoned Cast-Iron Pans. It should be noted that, after use, please do not immediately cool it down, to prevent the deformation of the vessel. Carefully protect the surface when you clean up, it is better not to use the dishwasher. After clean, please put the pans on a burner on high to dry. Then wipe the interior and exterior of the Pan with a small amount of vegetable oil to protect the cookware surface. Lodge is one of best Cast iron brands. America’s oldest family-owned cookware manufacturer, and its cookware are "natural nonstick." Cast iron cookware is the original nonstick cookware. And this Cast Iron cookware is able to cover all your bases. Another reason for this set is that they are all well-seasoned already. The more you use your iron, the better the seasoning will get. 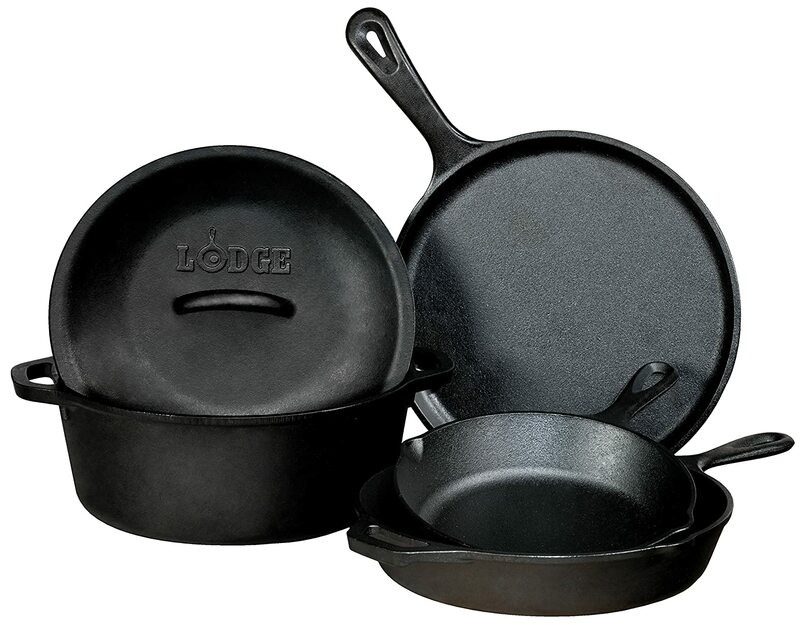 Some reason for Lodge, it has been making cast iron cookware since 1896. With over 120 years of experience, their cast iron is well known as high-quality design, lifetime durability, and cooking versatility. It offers a great gripping handle for stability, durable integral ovenproof handles for safety. It is the best product to be cooked in all places including electric, induction stovetops, gas, fire & grill. This product offers original non-stick surface, it is an amazing source of nutritional iron. Stainless steel is the most common kitchenware due to fast thermal conductivity, durability, corrosion resistance and ease of maintenance. The metal surface is extremely smooth and strong enough to prevent scratches caused by normal friction. In general, the Stainless Steel Pots & Pans are the best choice for kitchen novices. Stainless Steel Pots & Pans are easy maintenance and compatible with induction cooktops, Dishwasher, oven, and broiler-safe. However, after cleaning, cookware should be dry, so as not to leave water stains. To prevent surface dents, a small amount of salt may be added after the liquid in the cookware has boiled. In addition, avoid placing salt or acidic food in the cookware for a long time to prevent corrosion of the pot. Yes, it is safe. Stainless steel consisting of iron and chromium. This material does not flake, it resists corrosion. It is very stable and safe. Some low-quality stainless steel may discharge a small amount of nickel into the food, it is recommended to buy high-quality stainless steel cookware like The Cuisinart MCP-12N. Since the metal exposes to the food, be careful not to use acidic or salty food on the cookware for a long time. The Cuisinart MCP-12N Multiclad Pro has 3 layers, it is the best stainless steel cookware set. The outer layer base stainless, middle layer aluminum core and the interior layer stainless for cooking surface. The interior cooking surface is 18/10 graded and it is durable and great for corrosion resistance. The Cuisinart MCP-12N is the best pots and pans set for stainless steel. It has superior performance in terms of heat distribution technology. This cookware set and All-Clad D5 have similar traits in this area and they are on par. Both models are constructed with tri-ply with the middle made up of aluminum core. This center layer greatly offers superior heat conductivity. It allows even heat distribution on the bottom and on the side walls. But Cuisinart MCP-12N is much cheaper. This set of cookware has great versatility as you can use it on most of the cooktops such as induction, gas, glass etc. Unlike some other brands lids which can’t support beyond 350 degrees F, Cuisinart MCP-12N lids are constructed with great heat resistance that is oven safe up to 550 degrees F.
It constitutes a pure core of aluminum and also a brushed stainless exterior. Cool grip handles solid stainless steel engrossed handle stays cool on cooking top. Moreover, it is extremely dishwasher safe. It offers a lifetime warranty, it is amazingly suitable for induction cooktops. Heat-resistant glass ceramic cooking utensils as new material, not only for cooking but also for good food containers. Its surface has an inert impermeable surface, so cooking does not absorb the smell and taste of food. You can take out from the oven, continue cooking food. Glass ceramic cookware is suitable for many cooking methods: grilling, boiling, or baking. The glass is very sensitive to extreme heat changes and ensures that the cookware has been warmed to room temperature before placing it into an oven that has been preheated. At the same time, do not soak the hot dishes in water, or on a wet countertop to prevent the bottom burst. Yes, it is perfectly safe. Ceramic coated cookware consists of a metal body (usually hard anodized aluminum), while the cooking surface is covered by a layer of ceramic. Ceramic non-stick coatings are typically made from inorganic minerals, primarily silicon and oxygen. In other words, the chemical composition of ceramic is similar to sand and clay. 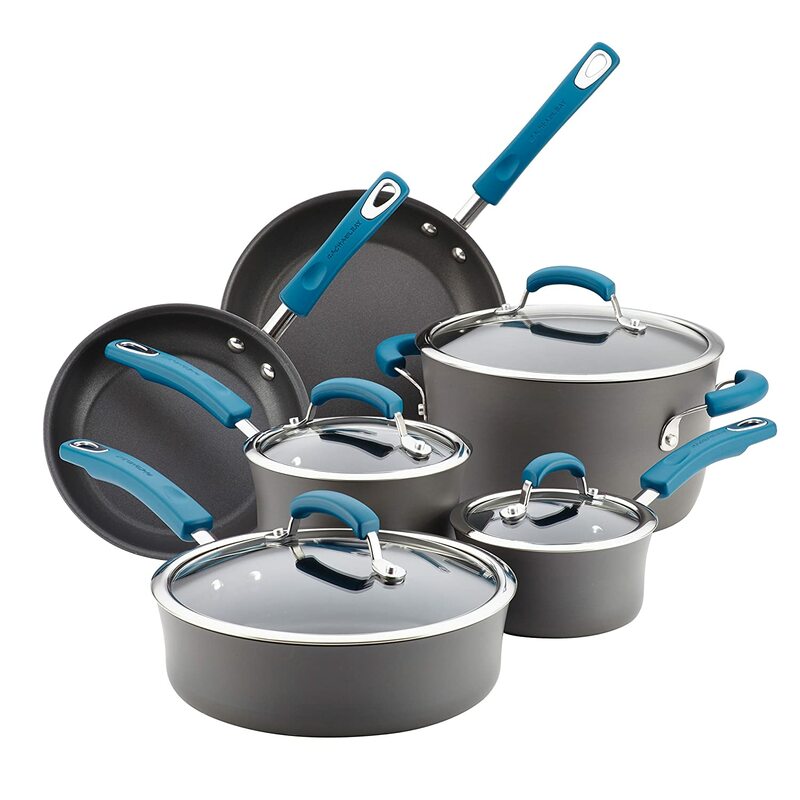 Ceramic coated cookware does not use a toxic chemical such as Teflon (PTFE) https://en.wikipedia.org/wiki/Non-stick_surface. Another benefit of ceramic coating is, it prevents the food from contacting the metal. (Anodized aluminum). Unlike the other coating, the ceramic coating does not chip off from the cookware. Usually, the ceramic coating degrades over time, it lasts about 3-5 years with normal usage. The inorganic composition of Ceramic non-stick coating makes it a more environmentally friendly product. It is one of the safest non-stick coating in the market. Ceramic is one of the best material as containers. This Ceramic Cookware interior is PTFE-Free, PFOA-Free. and Cadmium-Free safer than traditional nonstick pots. It is a limited lifetime warranty, safe for all cooking methods except induction, and it also nonstick. Tips: we don't recommend to use dishwasher and metal kitchen utensils, they will scratch the surface of the cookware. Is cast iron better than aluminum or Nonstick? After reading the introduction of different types of cookware materials, pots and pans recommendations, do you know what you would choose? If not, that is fine, let me give you some more advice. A set of stainless steel pots and pans are the best choice. They are affordable, durable, fast heating, easy maintenance, can be used as a good basic cookware, enough to meet your basic needs. E.g. 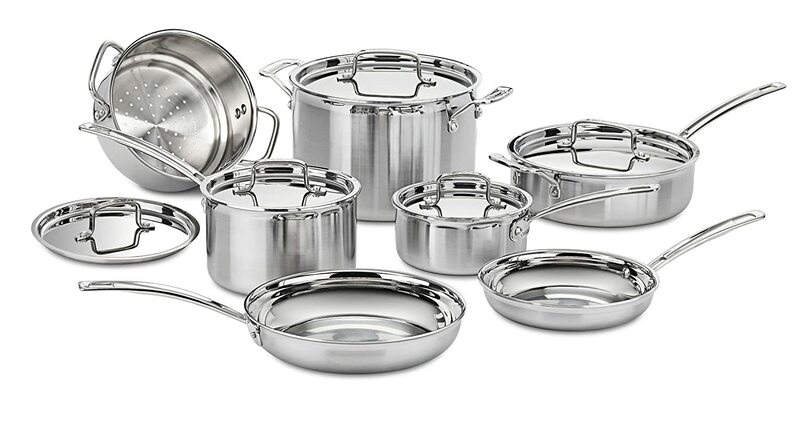 Chef’s Classic Stainless 10-Piece Cookware Set. Like a healthy diet person, you may be more concerned about eating healthy food, non-stick pots and pans will be a good choice. Nonstick can greatly reduce the chances of sticking food on the pot (or pan), you will use less oil which makes the cooking healthier. Needless to say nonstick is the best cookware material for health. E.g. Calphalon Unison Nonstick. For those who like to cook and enjoy the process from ingredients to dishes, you may need a variety of cookware. I recommend stainless steel and Cast Iron material. E.g. Cuisinart MCP-12N Multiclad Pro Stainless Steel 12-Piece Cookware Set. For a professional chef, because of better thermal conductivity, copper pots and pans are a better choices, however, they are more expensive and less well maintained. E.g. Lagostina Stainless Steel Copper Oven Safe Cookware Set. By now you should know clearly what kind of material pots and pans you need for your kitchen. What brand of pots and pans are best? In order to better help you to make the right decision, here are some of the best pots and pans brands. Calphalon: There non-stick pans is one of the best choice, e.g. Unison Nonstick, All cookware is dishwasher-safe and carries Calphalon's full lifetime warranty. Now you have the information about the different cookware products. It’s time to choose the one that fits perfectly for your cooking needs. However, if you guys ask us to tell about the best cook material, then there is no match of copper cookware. Most of the expert chefs using it for many years because the meal can easily be cooked in a perfect way. 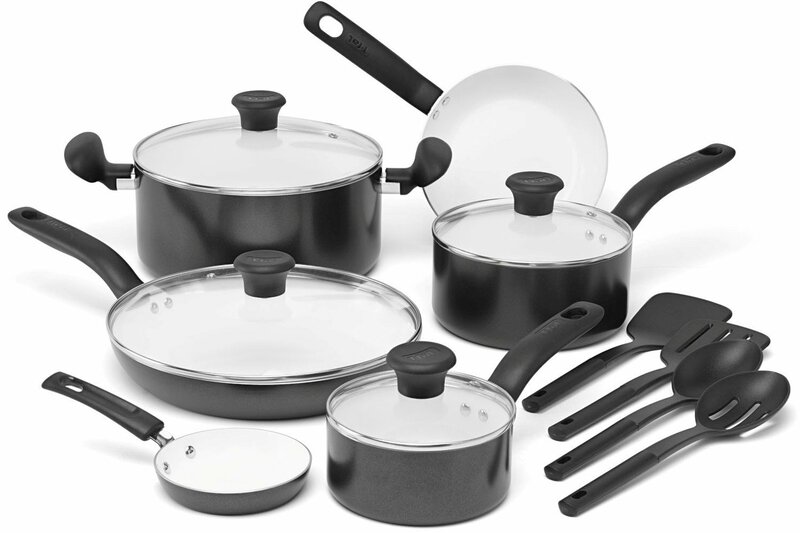 They are considered as the best pans and pots for food cooking. The main reason is that copper is a perfect heat conductor and thus this property make it the best choice for all. If you have any questions or suggestions, please let us know, and share this link to others if you like this article. “One cannot think well, love well, sleep well, if one has not dined well.” ― Virginia Woolf, A Room of One’s Own.